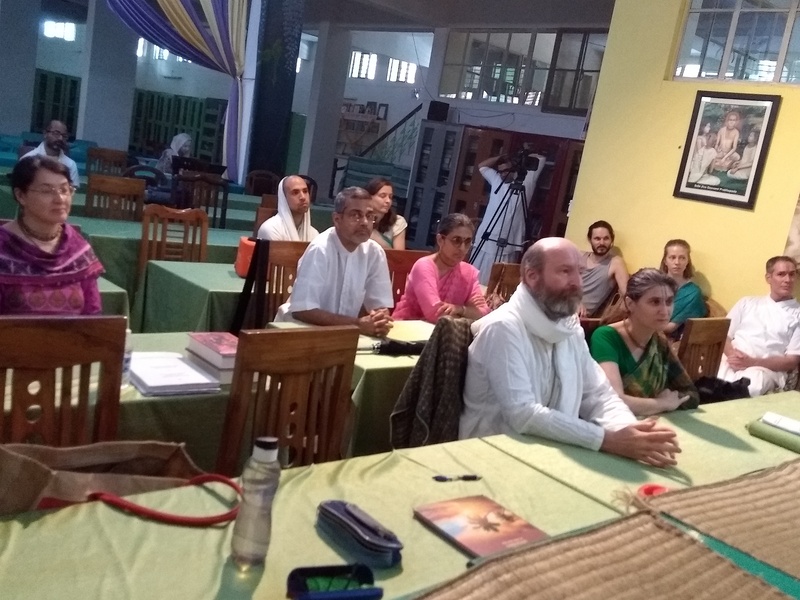 “I only expected ten people when I first conceived of this program several years ago,” said Babaji Satyanarayana Dasa at the closing ceremony of the second year Bhakti Tirtha course, “but now we have over 40 students from all over the world. I am very satisfied with the results.” Not only Babaji but also Sanskrit teacher Jagadananda Das Ji and all the students were satisfied with what has been achieved in this second year. Babaji’s desire has always been to create a place of learning here at Jiva where the knowledge of the Gaudīya sampradāya is preserved and taught by suitable modern techniques in a contemporary context. The format of the Bhakti-tirtha course, now in the second year, has already proven successful enough to become a model for similar concerted efforts of training in the Gaudīya school. We, the students, who have been able to attend the complete five ½ month course felt very fortunate that Babaji created such a facility for us. From the middle of October until end of March we have been spoon-fed this precious knowledge by someone who has understood and realized it. In this Bhakti Tirtha Course, which is designed for five years, Babaji is covering some of the basic works of all the Six Philosophical Indian Schools (Ṣaḍ-darśana). Last semester we studied Yoga and Nyāya. This semester we studied a treatise from the literary tradition analyzing poetic embellishments, Alaṅkāra-Kaustubha, along with Rupa Gosvāmī’s Bhakti-Rasāmṛta Sindhu, an erudite exposition of the stages of bhakti from the beginner to perfection. The other subject that Babaji teaches throughout the course is the Ṣaṭ Sandarbha, the six treatises on the Bhāgavata Purāṇa that he studied in depth from his own guru and translated from Sanskrit into the English language with his own commentary. Towards the end of year, Babaji also gave an introductory course on Hinduism to students from Rutgers University, which Bhakti-tirtha students also attended. Knowledge of Sanskrit is essential to deeply absorb oneself in these wonderful works and also to follow Babaji’s explanation. To facilitate that, Jagadananda prabhu has made it his mission to teach the students Sanskrit “in the most painless way possible.” He wants to avoid dreadful memorization of declinations and conjugations and instead tries to familiarize the students with the most common word forms through repetition and recognition in order to quickly enable them to study Sanskrit commentaries of the most common philosophical works that are studied by Gaudīya Vaiṣṇavas. In addition to these regular classes, we had several guest speakers and additional programs on the weekends. Every Saturday Radhika Devi read selected verses from Śrī Jīva Gosvami’s Gopāla Champū that she herself translated and commented on them. Krishna Kinkari Devi from the Puṣṭi-Mārga tradition gave several classes on the dramatic performance and musical arrangements of Rasa Lila performances in Vrindavan, which culminated in the attendance of such a performance. Jagadananda prabhu gave introductory classes on Gauḍīya history. Also, Master Hashijoki and her team from Siberia came here twice and gave practical workshops on bodywork and sound to achieve a higher level of awareness and vocal expression. 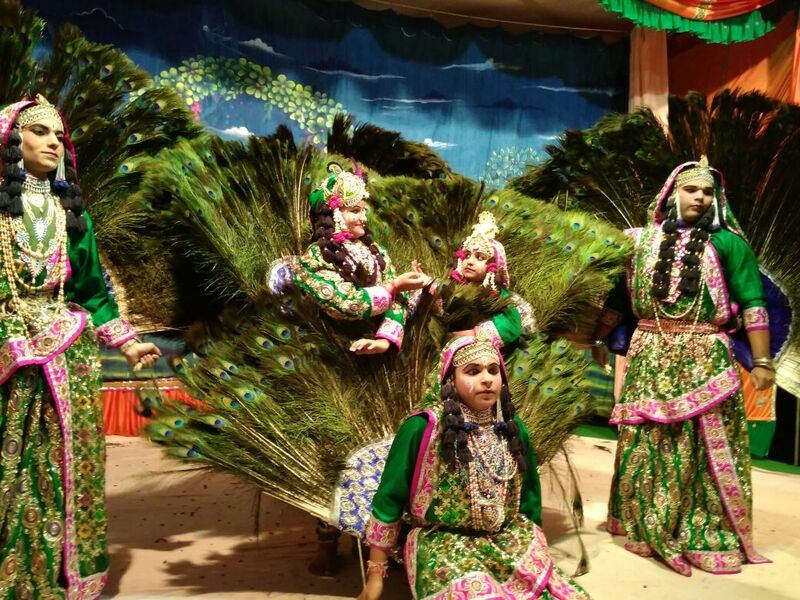 Some of the cultural programs were the traditional celebration of festivals such as Śrī Jīva Gosvāmī’s appearance day, Sarasvatī Pūjā, Holi festival, Oddisi dance and the Vrindavan Today Bhārta-nāṭyam performance. After the summer break, the third semester will start again in the middle of October. Audio recordings of the first two semesters are available. Please contact us: jivatirtha@jiva.org. The next semester of Bhakti Tirtha will start on October 15th. Registration is open now. New students can still join the course, but it is recommended to first listen to the previous recordings. During the Rutgers program from Dec. 27th – Jan. 15th there will be a Winter break, but students can attend if they like. Besides the regular schedule, we will have also weekend classes. Radhika Devi will read on Saturdays from 5 – 6 pm from Gopala Champu. Jagadananda Das Ji will give a course on Gauḍīya history. For registration please write to: Jivatirtha@jiva.org. Food per month: $ 250. Ashram: $ 150 per month. $ 800 for 6 months in advance. Student Hostel: $ 210 per month. $ 1100 for 6 months in advance. Guest House: $ 300 per month. $ 1600 for 6 months in advance. There are other options for food and accommodation in the vicinity, which students are free to choose. $ 550 for complete recordings of the whole course. Recordings for registered students who attend the course: $ 150. Each course can also be purchased individually. Details can be given upon request. Course materials are not included in the above fees.